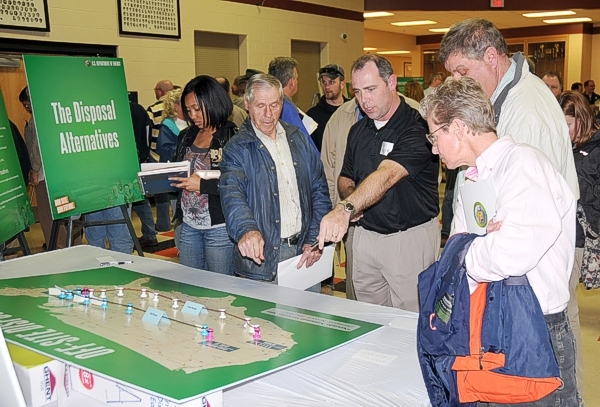 On January 31, 2012, Fluor-B&W Portsmouth hosted a public meeting at Waverly High School in Waverly, Ohio and detailed the cleanup plan for the gaseous diffusion plant. Please use the links below to download and view the materials used at this meeting. Frank Miller of Fluor-B&W discusses disposal alternatives with visitors during a public meeting hosted by the U.S. Department of Energy Jan. 31 at Waverly High School. The DOE is holding quarterly meetings to update residents on activities at the former gaseous diffusion plant in Piketon. Topics covered included pending decisions on whether the older facility will be demolished and alternative ways to dispose of more than 2 million cubic yards of material and debris from the forthcoming project. A formal public comment period will be held in the summer. The DOE, with Ohio Environmental Protection Agency agreement, is expected to decide on a disposal alternative in late 2012.